Be the first to share your favorite memory, photo or story of Lura. This memorial page is dedicated for family, friends and future generations to celebrate the life of their loved one. 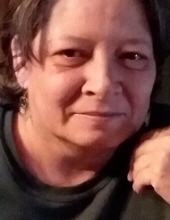 Lura (Lou) L. Wilson, 54 of Pennsville, Ohio passed away Tuesday, March 26, 2019 at Genesis Hospital in Zanesville. She was born June 26, 1964 in Beverly to the late Donnie Wilson and Perley C. Kester. Lura was a homemaker and loved taking care of her children and grandchildren. She also loved to garden. She is survived by her father, William R. Kester of McConnelsville, her Best Friend and Soulmate Robert McInturf Jr. of Pennsville, her children Danny Dupre of McConnelsville, Brandon L. Webb of Malta, Lorena Webb of McConnelsville, Lynna Hreha of Chesterhill, her grandchildren Dominique Stone of McConnelsville, Devin Stone of McConnelsville, five brothers, Bill Kester of New Philadelphia, Donnie Wilson of McConnelsville, Marty Wilson of Reinersville, Kenneth Kester of Streetsboro, and Jeremiah Wilson of Ravenna, 6 sisters Michelle Kester of Ravenna, Andrea Kester of Streetsboro, Nichole Kester of Streetsboro, Wendy Hreha of Malta, Jada Rittenhouse of Stockport, and Sabrina Brown of Columbus, and several nieces and nephews. She was preceded in death by a daughter Amber Webb, her mother Perley C. Kester, her father Donnie Wilson, a sister Katrina Houston, a niece Jessie Russell and her maternal and paternal grandparents. A memorial service will be held on Thursday, April 4, 2019 from 5-7 P.M. at the Matheney Funeral Home in McConnelsville. A caring cremation is taking place at her request. Matheney Funeral Home in McConnelsville is handling the arrangements. To send a note of condolence to the family go to www.matheneyfh.com. To send flowers or a remembrance gift to the family of Lura Wilson, please visit our Tribute Store. "Email Address" would like to share the life celebration of Lura Wilson. Click on the "link" to go to share a favorite memory or leave a condolence message for the family.